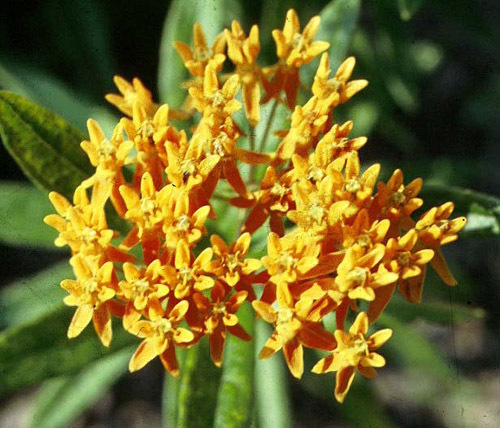 This hardy North American native grows about 3 feet tall and bears dense, flattened clusters of cheerful orange blooms, often covered with feeding butterflies. Propagation is difficult. But once established the plant is relatively easy and low maintenance. 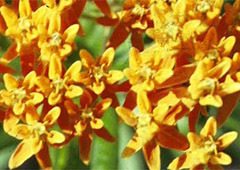 Orange is the norm, but the variety 'Gay Butterflies' may have red, orange or yelllow blooms. The leaves are arranged in a spiral around erect stems. Blooms borne in dense, flattened clusters atop the erect plant stems. non-aggressive - Self-seeds, but easy to manage. native to North America - Native to North American grasslands and meadows. Propagate by seed, cuttings, division or separation - Seed germination is erratic. It is improved by sowing fresh seed as soon as it is ripe. Use a well-aerated soil mix. Divide in the spring or fall, but division is difficult due to the long taproot. Do not prune in fall. Wait and cut back plants in spring. Mulch for the winter to prevent frost heaving. Plants need excellent drainage to overwinter. Plants are slow to emerge in spring. 'Gay Butterflies' has blooms in shades of red, orange or yellow.